Although sad to be leaving Glacier, we were excited to reach Yellowstone at the same time. The first part of this leg of our journey was to take us near Helena, Montana. I have to admit; I’ve always considered Oregon to be the most beautiful place in the world (of course being a life-long Oregonian, I’m slightly biased). However, after driving across Montana… I can barely bring myself to actually write it down–it would feel blasphemous–but Montana is AMAZING! The mountains, the plains, the sky, I never understood why they call it “Big Sky Country” until now. It was the most scenic 3 ½ hours I’ve ever spent in a car. 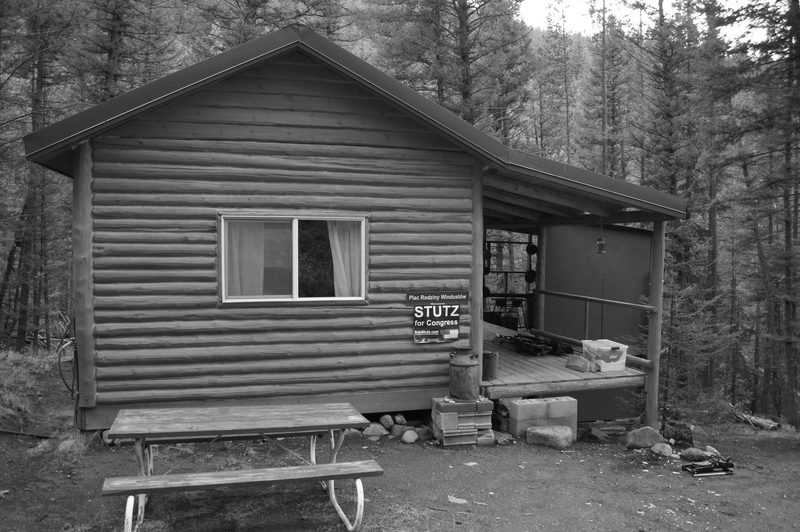 Our generous friends, the Stutz family, whom we’ve never actually met face to face, offered to let use their cabin. The Windusts, who never turn down a free bed, quickly accepted. We arrived at the Stutz’s cabin around 5 PM. Overestimating my ability to back our tent trailer down their driveway, I nearly ended up sliding my father-in-law’s truck down a steep bank into the adjacent creek (Sorry Dave). After unhooking the trailer, and doing some creative work with the jack, we were able to get the trailer back up on the road and parked in a nearby turnout, which is what I clearly should have done in the first place. Being able to make a fire in the wood stove, settle into a perfect cabin by candle light, and have a lovely dinner is exactly what was needed to settle our frazzled nerves, that and a few sips of a hot toddy. The next day started off in the capital city of Helena. One of the best things about life on the road is finding little gems where you aren’t expecting. The General Mercantile (www.generalmerc.com) coffee shop was one of those places. Filled with knick-knacks that kept Indi entertained, a cribbage board for Wendy and I, and good coffee. Our barista just also happened to be named Indi & we chatted with the owner for a while. He started the business when he was 25 and had been at it for nearly 40 years. That, and he correctly predicted that Wendy would beat me in cribbage despite a seemingly insurmountable lead that I had at the time. We hit the road and drove to the cute town of Livingston where we rented a small house to organize our camp gear, do laundry, and prepare for our stays in Yellowstone and Glacier Nat’l Park, part the less glamorous side of life on the road (Wendy’s upcoming post will detail all the nitty gritty details of living a nomadic life style). 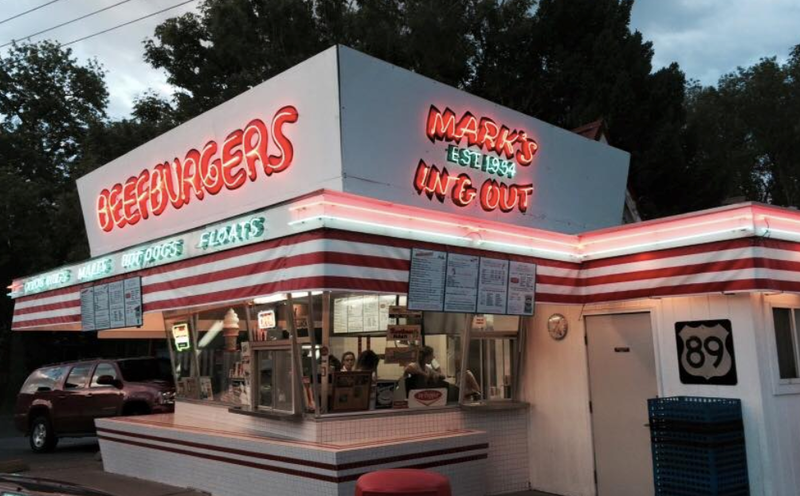 It was a relaxing couple of days and we found another delicious hole in the wall drive-in, Mark’s In and Out to enjoy our final prepared meal for a while. 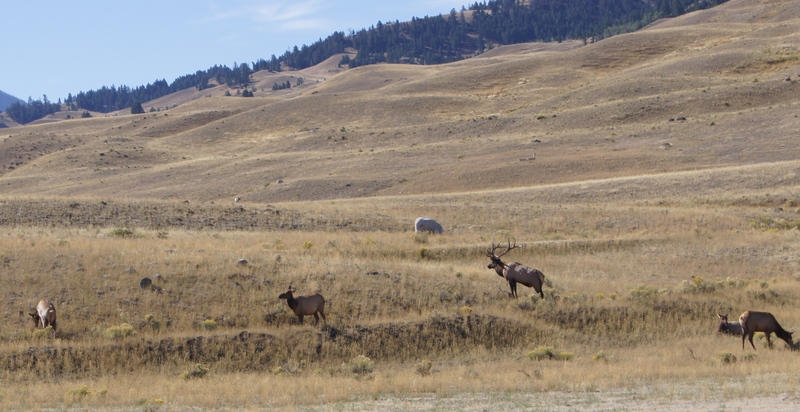 Finally, we pulled into Yellowstone, our nation’s first national park—what we were most looking forward to on this trip—and it didn’t disappoint. As we waited to enter the park a herd of deer greeted us, and during our five days in the park we saw countless bison a few bears, and moose. We reached the Norris Campground in the north of the park around 11 AM and got one of the last remaining spots. We were surprised that the camp remained full nearly our entire stay and how many people were in the park despite it being mid-week September. 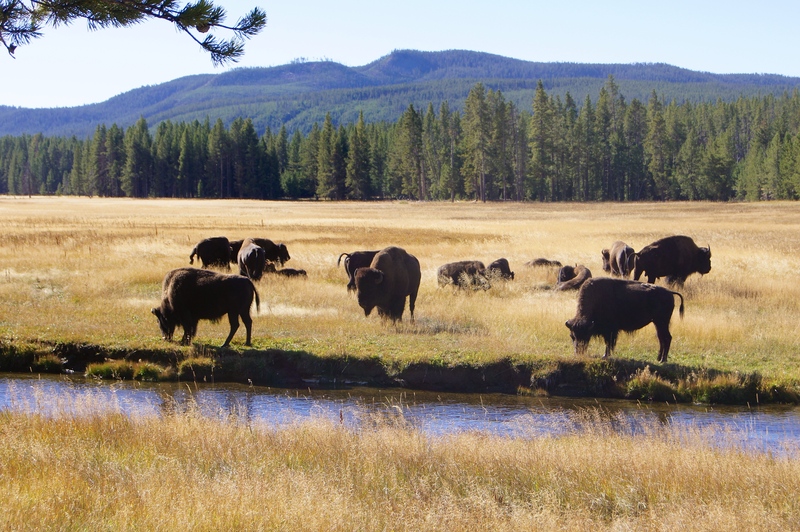 The Norris Campground was at a good location in the park, close to the many geysers and overrun by bison each morning and evening. 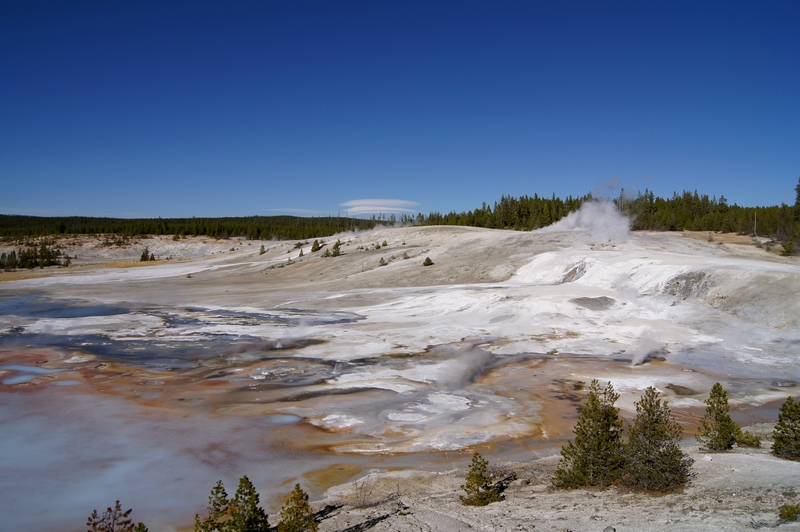 The Norris Geyser Basin, about 5 minutes from our camp, and when the wind blew just right it smelt even closer. The weather could not have been better and it was sunny during our entire stay with highs consistently near 70 degrees, blue skies, and fluffy clouds to boot. At night it did get cold, slightly below freezing. 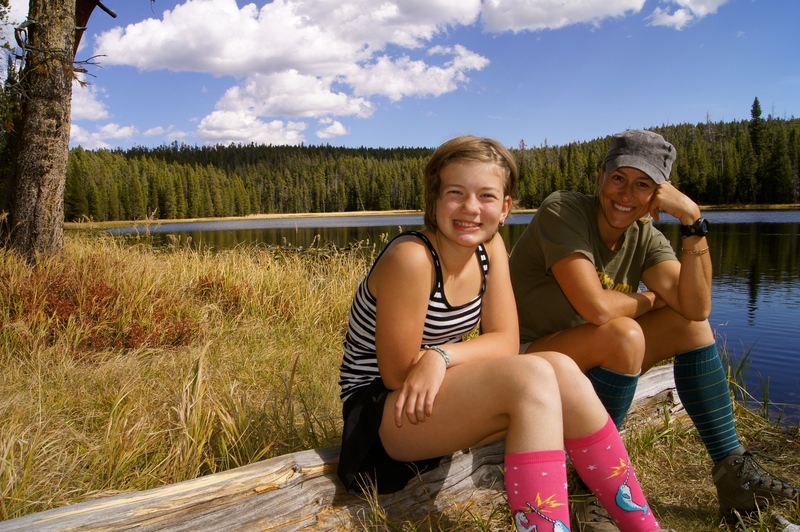 I guess we should have been expecting as much since we were camping at almost 8000 feet. Our old tent trailer is not the most insulated vehicle, but our small propane heater worked well enough to take the edge off and keep us comfortable. Yellowstone is truly an incredible park. 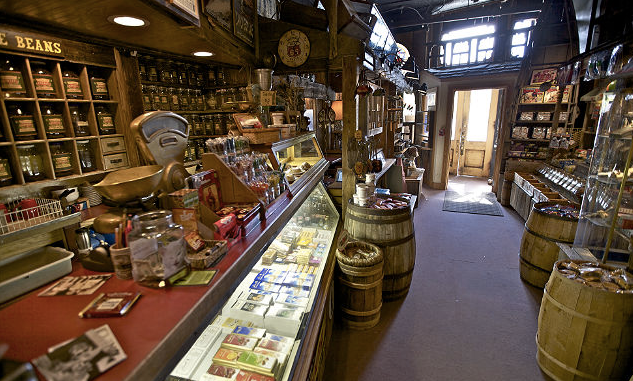 The visitor centers are great and we all learned a lot about the region and history. And, of course, we did several incredible hikes. I was expecting Old Faithful, but there are over 10,000 geothermal features in the park, more than the rest of the world combined. 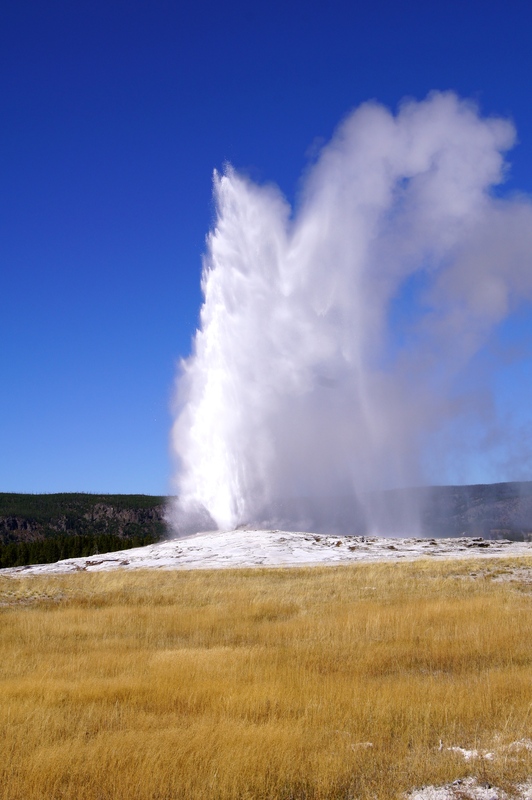 Everywhere you turned there was a bubbling mud pit, exploding geyser, or steaming vent. The Yellowstone Grand Canyon was magnificent as was Yellowstone Lake. However probably our best hike was to the lesser-known Ribbon Lake. The hike started with a bummed out little girl. The evening before Wendy and I spotted a bear but Indi missed it and she was worried she would go the week without seeing one. We suggested she say a little prayer to God in the parking lot before we start asking if she could see a bear, we stepped onto the trail and about 30 seconds later, wouldn’t you know it, a bear wandered down near the trail. The day before I had bought a can of bear spray after seeing about 100 signs saying you should carry it, at the time Indi told me spending almost $50 on bear spray was too much, but as we watched the bear from a safe distance, Indi changed her mind and told me that $50 was actually not too bad of a price. Another mile up the trail we came to our first fork, Wendy and I both thought the other had brought the map. So after a few minutes of pointless bickering, we went the way we thought we were supposed to go, and naturally we guessed wrong. The good news was that this was one of those good mistakes that led us through wide-open plains, beautiful forests, and a great alpine lake. 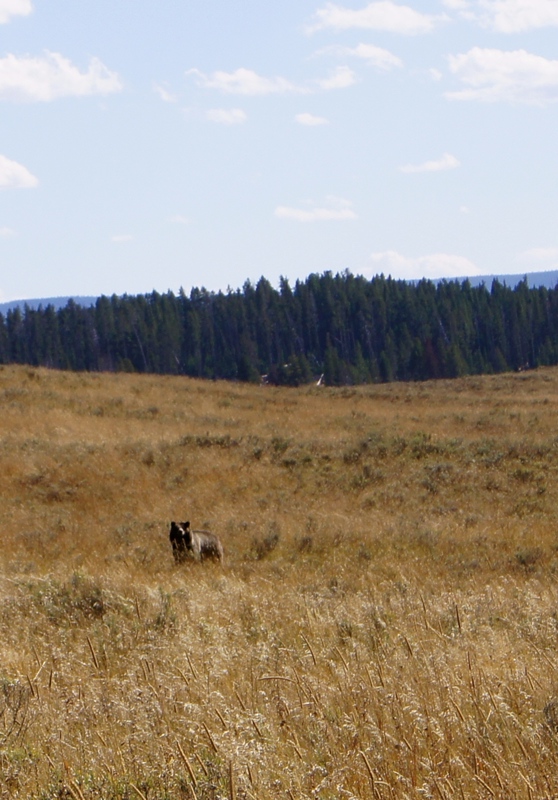 At one point we had to veer off of the trail due to two huge bison (are there any other kind?) blocking our path. On our final day we wanted to get an early start to make sure we made it to Teton National Park early enough to get a campsite. It was chilly packing up camp at 6:30 in the morning and I’m sure our neighbors weren’t particularly happy with us. Regardless, we hit the road by 7:00 and were treated to a beautiful drive out of the park, enjoying a lovely sunrise as it burned off a low lying fog.